This large skewer helps kids recognize and manage their emotions. Discuss them while playing individually or in a group. Dealing with emotions as if they were ingredients is great fun, helping kids recognize and understand up to 10 different emotions. Several different kinds of game are described in the guide. This skewer will help kids learn to recognize and interpret up to 10 different emotions! The teaching guide contains 3 modes of cooperative game to enhance children's creativity and work on the emotions. 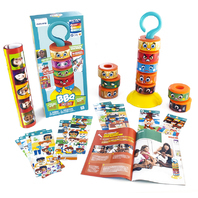 Includes 1 skewer, 1 base, 10 beads, 20 stickers, 10 game cards, 1 poster and 1 teaching guide.